This was a custom I had been wanting to do for a long time. 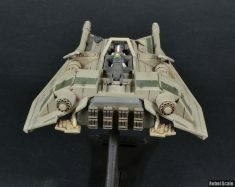 In several books (Essential Vehicles and Vessels), as well as online resources, information about the Rebel Snowspeeder often mentioned variants: swampspeeder, airspeeder, and sandspeeder. 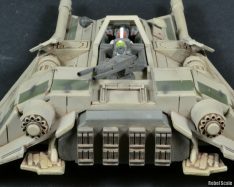 Later, I found a picture of a Rebel Assault Speeder in the Force Commander game booklet, which had a tan Snowspeeder with a half canopy. From the vague book descriptions and picture, I decided to make what I thought would most resemble a T-47 Sandspeeder. I started with an AF Snowspeeder, which I promptly took apart. I cut off the excess canopy and added styrene strips to simulate the frames. I cut the lower air brakes away from the engine, then I cut the heatsink fins from the engine. I used styrene to cover the engine, which was made from a rubbery plastic, and did not look smooth at all. I then added an engine from a Dragon model tank to the existing engine block, and added random parts for detail. The rear dust shoots are made of a spliced-up magazine rack from the same tank kit. The interior engine space was already there, so I just added the walls and details (like the fans made of WWII mines). More plastic parts made up the sand deflectors over the lasers, and the navigation equipment near the front of the craft. The rear turret was made from a tank kit piece and brass rods. Smaller rods, when passed through plastic, allowed the cannon to elevate, whereas a simple plastic rod glued underneath the turret allowed it to rotate. I finished by adding cockpit details and controls from WWII plane cockpit pieces. Painting consisted of two basic colors: a custom tan/grey for the overcoat and a Medium Green for the highlights. An assortment of greys provided the gradients I wanted for the engine, turret, and cockpit. The interior engine compartment I painted an off-white, which is similar to the color used in the Incredible Cross-Sections book. I then heavily weathered this beast with two washes, dust stains, dirt stains, oil leaks, and chipped paint. I added a few decals to the model to give it a more personal look. 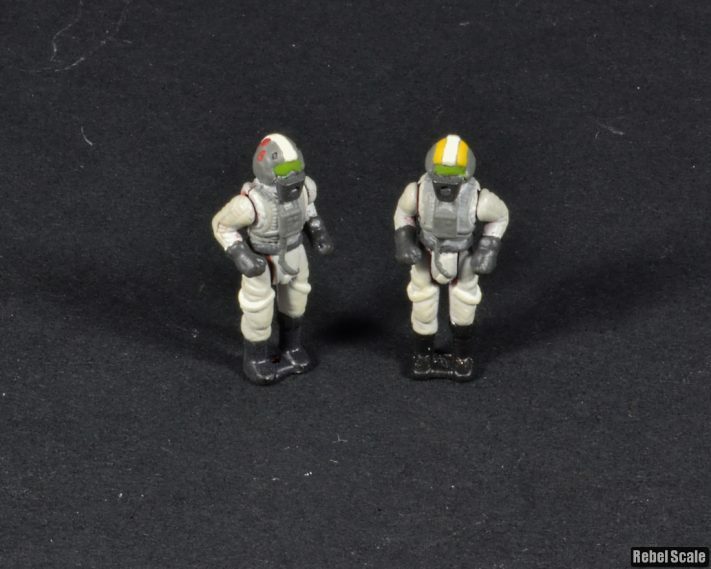 The pilots were basic repaints, except that I added breath masks to their helmets. The gunner is the one with the yellow marks, while the pilot has the red lines and the black circles. Both have green sun-filtering goggles. In an effort to adapt to various environments, Rebel technicians used a plethora of civilian vehicles modified for combat use. Among those was the T-47 airspeeder, which became a mainstay for Rebel outposts as it was easily acclimated for extreme conditions. The most famous of these variants was the snowspeeder, finalized shortly before the Battle of Hoth. 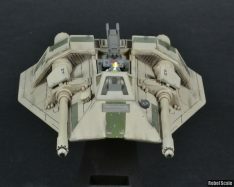 Other variants were produced however, including the T-47 Sandspeeder, which saw action on several arid planets. The T-47 was an ideal base for a desert repulsorlift combat speeder. The structure of the T-47 included powerful drive engines, which provided more than enough power for the repulsorlift, as well as the drive units. The engine itself required little modification, but engineers found that the engine heatsinks were not powerful enough for extremely hot conditions. To compensate for this, they added two large fan systems creating a more active cooling system. 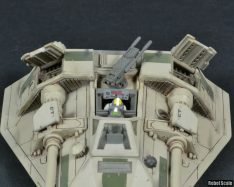 The power system was also upgraded to accommodate the large laser cannons and the rear weapons rack. The major problem Rebel technicians faced was preventing sand and dirt from getting into the engine systems. With the large air intakes on either side of the speeder, technicians had to install several sand filters. They redesigned the air intakes to funnel air into the large cooling fans, where engineers added more filters. Technicians also removed the heatsinks from the engine and replaced it with smaller heatsinks that included sand chutes for dumping out sand and dirt gathered in the air filters. This caused the speeder to generate unique dust trails, as the sand chutes dumped the dirt immediately next to the thrust nozzles. 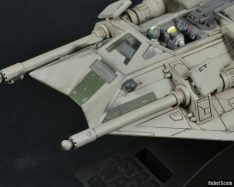 Unlike the other T-47 speeder variants the Rebel Alliance employed, the T-47 Sandspeeder featured an open cockpit, with only a windscreen at the front. Originally, technicians worried about dust in the control systems, but pilots soon found that a closed cockpit retained too much heat. The cabin air intake was ineffectual at cooling the cockpit as it usually clogged rather quickly. Designers soon removed the bulk of the cockpit and equipped pilots with dust filter masks. Fortunately, the aerodynamic design of the T-47 actually forced sand over the cockpit entirely, keeping most of the interior free of sand. 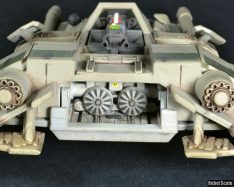 Like the snowspeeder, the T-47 Sandspeeder sported two military-grade laser cannons strapped to either side of the cockpit and fitted with power converters, which drew power from the engines. Atop each power converter was a sand shield plates, designed to deflect sand from the interior components of the air brakes. While not moveable like the air brakes, these plates did act as heat sinks for the laser generators and power couplings located directly under them. 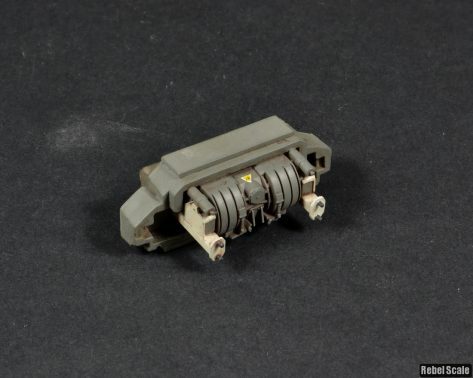 Engineers replaced the T-47’s cargo tow cable with a modified weapons mount, which could hold medium-power assault weapons such as twin blasters or a concussion grenade launcher. Unlike the T-47 cargo harpoon, the new weapon mount could rotate a full 360 degrees allowing the gunner to target enemies ahead of the craft. Navigation systems received multiple improvements over the base T-47. Because of desert sandstorms, engineers equipped T-47 Sandspeeders with a long-range navigation radar, which they fitted around the unused cabin air inlet. On the opposite side, they added terrain scanners and sensors. These navigation packages, slaved to the air brakes, effectively prevented the speeder from crashing into the ground, and even allowed experienced pilots to fly at night without concern. Final versions of the T-47 Sandspeeder saw action on many arid planets, including Tatooine. 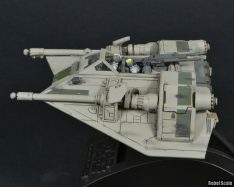 The Alliance mainly used the T-47 Sandspeeders for long-rang reconnaissance and surveillance of Imperial positions. 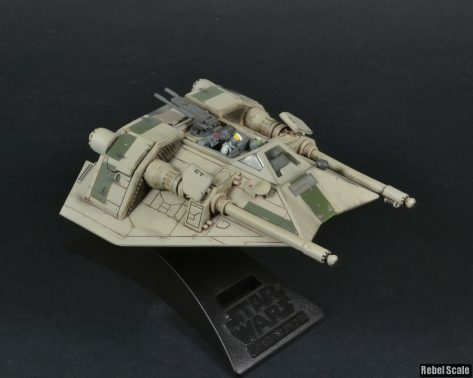 In combat, the T-47 Sandspeeder fared quite well, usually tackling smaller walkers or cargo speeders with ease due to its high-speed and maneuverability. Against Imperial outposts and bases, Rebels employed hit-and-run strategies and decoy tactics, but rarely were T-47 Sandspeeders the first line of attack on hardened installations. Apart from their military obligations, later T-47 Sandspeeders were reconfigured to their base schematics, ditching laser cannons for cargo lines.